Is going to the usual desk calendar, organizer or nuts and sweets? You know how important to stay in top-of-mind with your clients. You want to show your clients and well-wishers that you really appreciate them in a genuinely thoughtful way, not in an “here’s an expensive box of nuts and dry fruits” kind of way, so here is a gift idea that promises not only to be culturally and historically illuminating but visually compelling and a music lover’s delight. By gifting this fabulous book, you not only promote your company and thank your clients but also lend a hand to share awareness of our brilliant past. Are we, as today’s citizens, building a culture which will be remembered a thousand years hence? 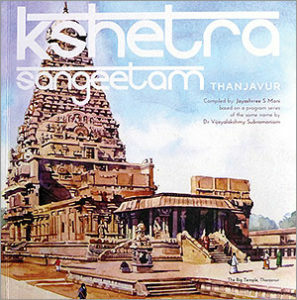 The book manages to capture not just the core subject Kshetram and the Sangeetam that revolves around it, the mystique of the architecture the aspects that enthrall a person on ground is beautifully captured to keep it engaging to the younger generations. A fabulous value add as a seasonal gift for connoisseurs. A thoughtful gift that is not only to be culturally and historically illuminating but visually compelling and a music lover’s delight. A compound Sanskrit word (Kshetra + Sangeetam) which means music composed on the various aspects of Kshetras (physical or spiritual) and the deities which are worshipped there.